How Women REALLY Use Media Channels | ASTRALCOM - Content Strategy, Conversion Marketing and Customer Acquisition. Did you know that 69% of women use the Internet to get ideas on new brands and products that they’re interested in? 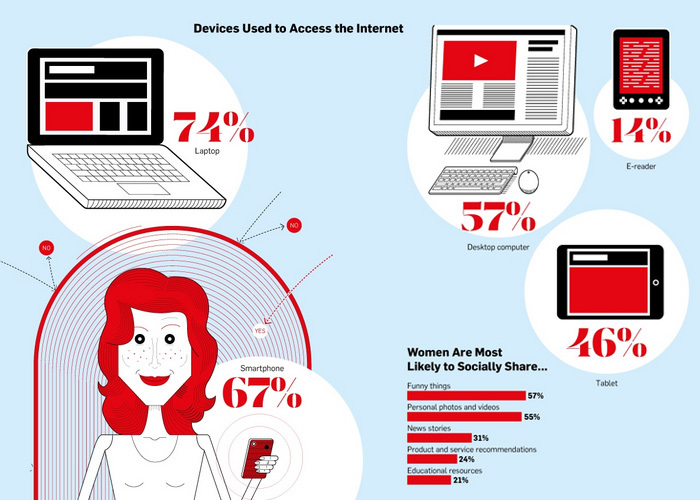 In this infographic from Adweek, you’ll learn more than just how women use the Internet. As a whole, women’s spending power continues to increase and as marketers, it’s critical to understand women’s media habits so that we can connect with them more effectively. This points to why multichannel messaging is important for brands that want to grow exponentially. That’s what we do for our clients – help them grow exponentially – by helping them create meaningful engagements with all their customers along the path to purchase. We can do it for you, too. Just click or call us at 800.536.6637 and we’ll help you effectively segment your audience, create engagement and increase your sales.